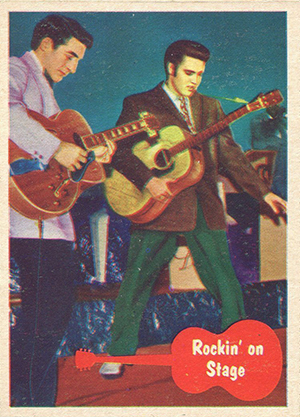 1956 Topps Elvis Presley is the first of many trading card sets dedicated to the King of Rock and Roll. Not just focused on music, it also highlights the beginning of his acting career. Printed under the banner Bubbles Inc., the 66-card 1956 Topps Elvis Presley checklist has two distinct sections. The first 46 cards center on his music. Card fronts have a full-color photo and a caption that is inside a red guitar. These cards are sometimes referred to as "Ask Elvis" cards because of the card backs. The top of the card has a blue banner that has the card number, an illustration of an operator and a question. 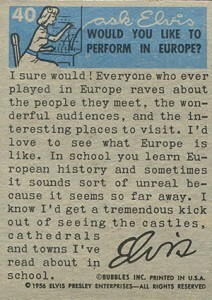 The text below is meant to sound like Presley answering the fan's question. 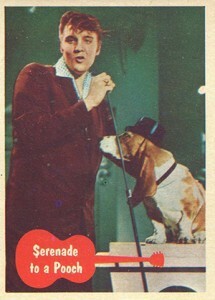 The final 20 cards in 1956 Topps Elvis Presley center on his feature film debut, Love Me Tender. Card fronts have a color picture from the film. 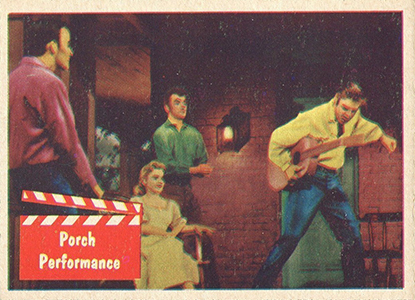 The red guitar from the music cards is replaced by a clapboard. 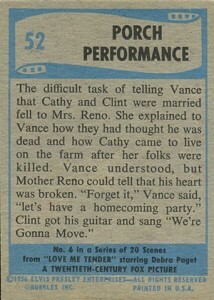 Card backs recap the film's plot. The blue banner at the top includes a film strip graphic with the card number and a bold caption. The bottom of the card has another banner that lists the subset as a "series of 20 scenes," further separating the two sections of the set. 1956 Topps Elvis Presley remains one of the most popular entertainment trading card sets of the post-Era. Singles, no matter the condition, continue to trade strongly on the secondary market. Measuring 3.5" by 2/5", the set is also notable for being one of the first (if not the first) Topps sets to have the traditional dimensions used in most sets today. 53 "I Want an Honest Answer"
57 "I'm Going to Vance"
60 "Don't Try to Stop Me"
64 "Let Him Have It, Clint"
66 "Go Back to Vance"
Thank you Ryan, a fascinating collection of Elvis Presley cards. I remember them circulating here in Europe back in the 1950s. Where can I sell these. They are in good condition except for one card. Rita � You may want to look into taking them to a local card dealer if that’s an option and asking if they think they’re worth grading. Sending them to a professional grader like PSA could add more value to them if they’re in top shape. It would also make it easier to sell online, like eBay, where you’ll get the biggest audience. Hi, I have a trade card of Elvis and I can”t find it anywhere on the net to see what its worth can you help me? I have 64 of the 66 card collection….very good condition….need to find buyer….any ideas? What numbers are missing? I have a complete set. I also have many odd numbers. Maybe we can finish up the whole set. Though I grew up hating Elvis — always preferred Buddy Holly — I ended up with a lot of this Topps set. The only cards I recall buying were baseball and hockey cards — have hundreds of Topps and Parkhurst cards — so I must have won these Elvis cards from friends. Am still missing 21 of the set — 2, 3, 4, 11, 12, 27, 28, 29, 42, 44, 46, 55, 56, 58, 60, 61, 62, 63, 64, 65, 66 — and would be interested in any cards, regardless of condition, to complete the set. Am NOT a collector of ‘Mint’ cards; all my cards were played with during and after school. I have two duplicates — 17, 48 — which I would like to use to trade so that I could complete this set. I have mint 65 62 61×2 59×2 58 56 49 47 45 41 38×2 35 34 33 32 29×2 24 23 21 20 19 16 15 13×2 9 8 7×2 &1 make offer on all or individual. 1956 Topps ELVIS PRESLEY # 49 NEW MEMBER OF THE FAMILY PSA 7 NM Many Listed !! 1956 Topps ELVIS PRESLEY # 50 HARD WORK PSA 7 NM Additional cards ship $.50 ea. 1956 Topps ELVIS PRESLEY # 22 THE FANS'S FRIEND PSA 9 oc Mint PACK FRESH LOOK !